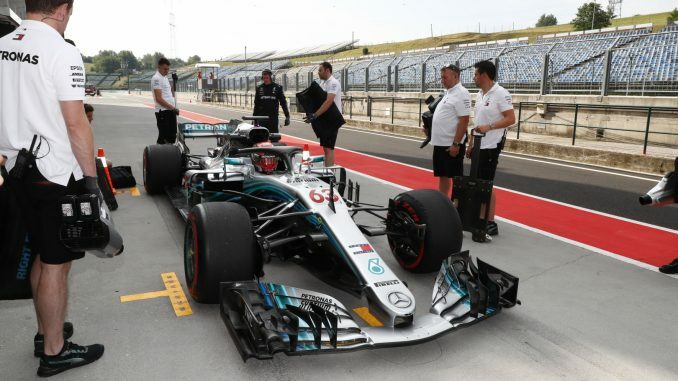 Formula 1 is officially on its summer break following the conclusion of the two-day in-season test at the Hungaroring. Antonio Giovinazzi set the pace in Tuesday’s running with an unofficial track record in the Ferrari before Mercedes reserve driver George Russell beat it with the quickest time of the test today. Haas skipped the test after recently taking part in a Pirelli test at Silverstone, while Toro Rosso ran two cars – one with their own program and one on behalf of F1’s tyre supplier. 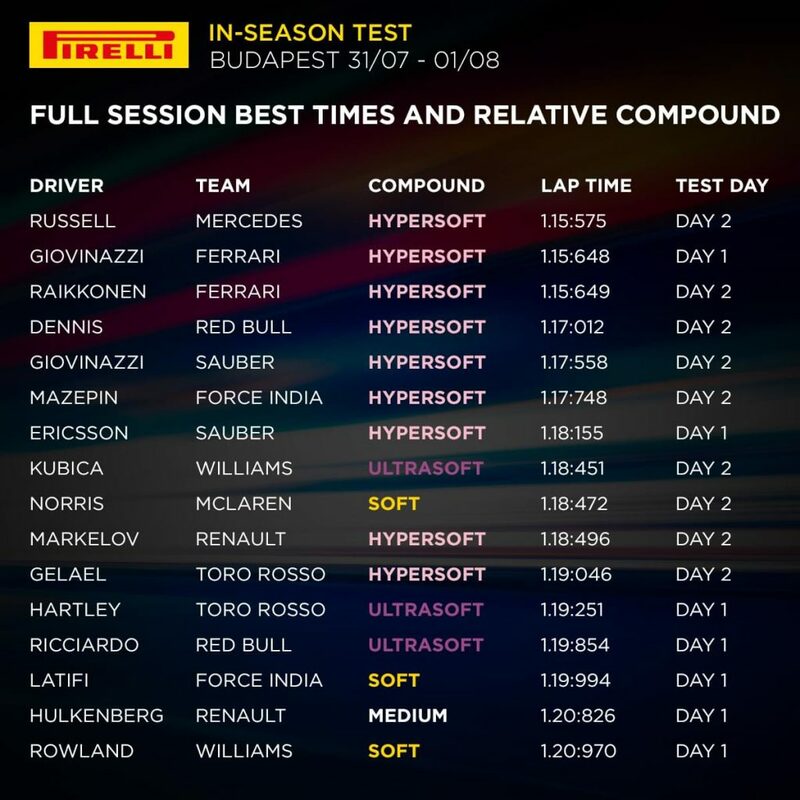 Having secured pole position and a race victory at the Hungarian Grand Prix on Sunday, it was no surprise to see Mercedes at the top of the timesheets again during the test. George Russell’s 1:15.575 set on the hypersoft tyre this afternoon was the fastest time of the test. According to the team, Russell’s workload focused on testing aerodynamics and brake developments, as well as general car set-up. The F2 championship leader had also been in the car on Tuesday, but his running was interrupted by gearbox problems and rain, although the team were able to log data on the vibration of the engine and chassis components. Having set the quickest time of Tuesday, Ferrari finished Wednesday’s running less than 0.1s behind Mercedes with Kimi Raikkonen at the wheel after test driver Antonio Giovinazzi was in the car on Tuesday. The Finn’s efforts focused on set-up solutions and tyre testing, with Raikkonen using five different compounds during his 131 laps, including an unmarked experimental compound from Pirelli. Giovinazzi’s runs were interrupted by rain on Tuesday, but Ferrari insist he still managed to complete his programme. Simulator development driver Jake Dennis set the third fastest time today after Daniel Ricciardo put in 125 laps on Tuesday. Ricciardo was one of the busiest driver’s on Tuesday, with only Toro Rosso’s Brendon Hartley completing more mileage, but the Australian was only sixth in the standings, with Red Bull quiet about what they were testing during his laps. 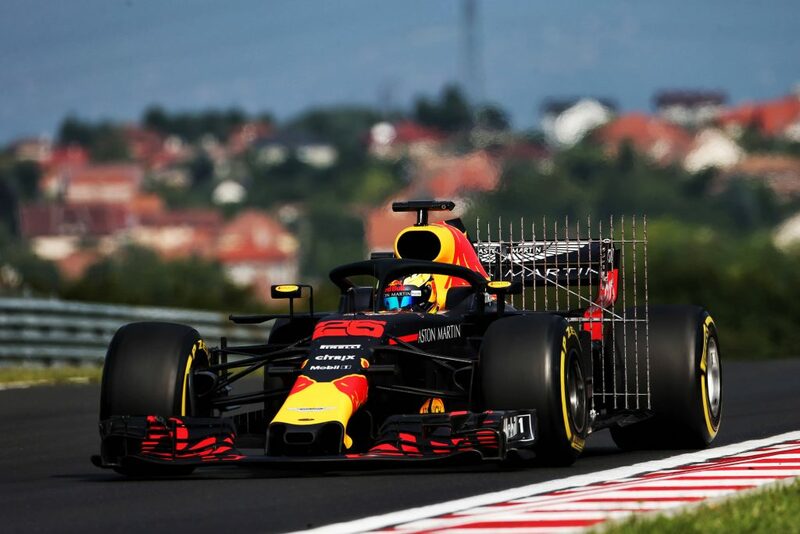 However, Red Bull confirmed Dennis ran a range of parts that are aimed at next year’s RB15 this morning, as well as doing some aero mapping and tyre work. The team says Dennis’s contribution will be an enormous value for the final nine races of the season. Force India gave both of their race drivers the week off, with Nicholas Latifi and Nikita Mazepin taking part in the test. Latifi was first in the car, with the team focussed on aero parts for the 2019 season. The Canadian had hoped to put in some work on the hypersoft tyre, but the rain prevented him from completing his planned programme. Mazepin had better luck with the weather and was fifth fastest today, despite managing just 51 laps for Force India due to a couple of technical issues. Chief engineer Tom McCullough praised the team for getting the car back out in the afternoon, and described the test as two productive days for the team. 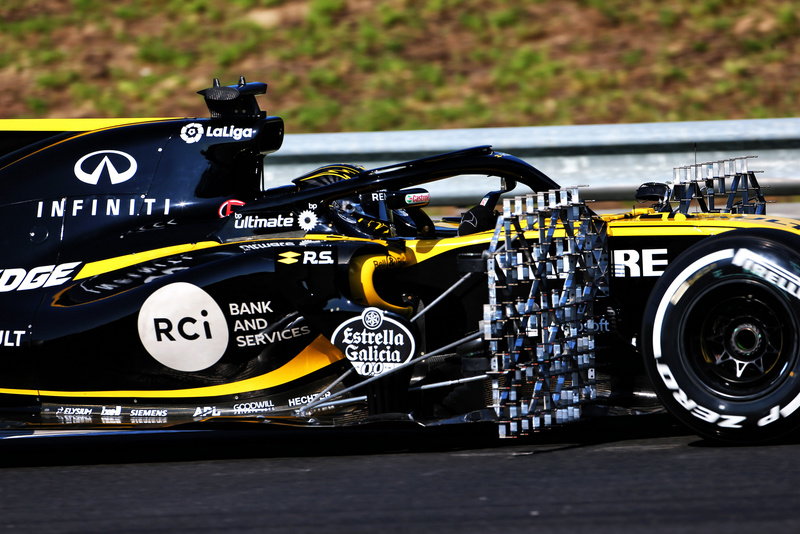 Nico Hulkenberg was on the track on Tuesday for Renault, but a couple of technical problems meant the German was the slowest full-time driver in action, with only Williams’ Oliver Rowland and Sean Gelael in the Toro Rosso for Pirelli going slower. The diagnosis and rectification of an electrical issue limited Hulkenberg to 63 laps. Formula One Testing. Tuesday 31st July 2018. Budapest, Hungary. Meanwhile, F2 driver Artem Markelov drove the R.S.18 for the first time today and was 1.4s quicker than Hulkenberg on Tuesday, and less than 0.05s off the pace set by Williams reserve driver Robert Kubica and Lando Norris in the McLaren. Reserve driver Lando Norris was busy for McLaren, completing 180 laps over two days for the team in the MCL33. Norris’s first day focussed on aero correlation and development over shorter runs, before turning his attention to longer runs in wet conditions in the afternoon. The team put new components on the car this afternoon as well as carrying out tyre-compound evaluation. The teenager said: “Yesterday was quite tricky because it was the first time I’d driven in the wet in Formula 1, and it’s quite a different experience to Formula 2. Driving these cars does take a bit of time to get used to, but a lot of it’s just because of the run-plan, testing a lot of different parts and getting aero data. After setting an unofficial lap record with Ferrari on the first day of the test, Giovinazzi was back in action today, this time in his role as reserve driver for Sauber. Marcus Ericsson was in the car on Tuesday, and set the second fastest time of the day, albeit 2.5s slower than the Italian. Ericsson’s work included mechanical set-up work, testing new aero parts and running various tyre compounds, with Giovinazzi running a similar programme today. Giovinazzi’s time of 1:17.558 was over 0.5s quicker than the mark set by Ericsson on Tuesday, with both drivers posting their quickest times on the hypersofts. Williams had reserve driver Robert Kubica and young driver Oliver Rowland in the car for the Hungary test. The team’s focus for Tuesday was preparing for the 2019 regulations, with Rowland’s car running a 2019 aero specification front end. Kubica’s runs also predominantly looked towards next year, with the team running an eye-catching amount of flow viz paint. Rowland only managed to put in 65 timed laps due to the weather conditions on Tuesday, but Kubica had a busy day with 103 kaps, ending the day sixth fastest of the 11 drivers running on Wednesday. Toro Rosso were the only team to have two cars on track during this test as they ran a second car for Pirelli. As a result, the team kept both race drivers on for the test, as well as using test driver Sean Gelael. Brendon Hartley tested a number of new items on Tuesday, but was unable to run everything the team had hoped yesterday due to the wet conditions. His programme included mechanical setup, aero work and power unit tests for Honda. Hartley and Pierre Gasly moved into the Pirelli car today with Gelael coming into the Toro Rosso seat. He added 122 laps to the 109 he completed on Tuesday, completing aero mapping and aero rake work, before focussing on suspension components after lunch.